The Ranish partition manager is a free, open source project, which you can install on your PC to partition the hard drive. The software for Ranish is available at Sourceforge. The utility is named after Michael Ranish who developed the code and maintains it. The ability of the tool extends to making several primary partitions. In fact, you can create up to 30 and install different operating systems on each. Besides Windows, you can install Linux, FreeDOS, and FreeBSD on a Ranish partition. Ranish Partition Manager, which is also known as RPM can be used to copy a partition in its entirety to create a backup disk. This cloning occurs at the bit level. You can also run RPM off a removable disk to create a recovery disk. Unfortunately, Ranish Partition Manager doesn’t run on Windows 10. However, Ranish Partition Manager is by no means your only option when you are looking around for a way to copy disks or create partitions. You can read more about these alternatives in the next sections. Cute Partition Manager is a free tool that will enable you to set up partitions on your PC. This is not a computer-resident app. Instead you have to copy the program onto a disk or USB stick and boot off it to get to the partition manager screen. The interface isn’t of the point-and-click GUI variety either. Instead, you use the keyboard to enter character commands. The screen does emulate a form layout through the use of characters, though. The tool is in the format of blue screen BIOS utilities. Although the absence of a GUI interface can be annoying, this scenario does have its advantages. For one thing, without the presence of screen coding, the program is very small. Also, this means that you can use the Cute Partition Manager to set up partitions even before you install an operating system. The utility has a range of file system capabilities including FAT16, FAT32, NTFS, Linux Swap, EXT2, EXT3, and Resier. You can also alter and delete partitions with the utility. Paragon Partition Manager is another great free alternative to the Ranish tool. This tool sits on top of the operating system and is available for Windows. The interface for the utility is very sophisticated and it has a great look to it. This software is part of a free bundle, called Paragon Hard Disk Manager for Windows. The basic functions of the tool enable you to create and remove partitions. You can choose between HFS and NTFS and even convert a partition from one file system to the other. The adjustment features are really impressive. You can alter the sizes of partitions and redistribute storage space with a slider. The tool is also useful as a file management system. It can transfer files to other local drives for you and also to connected storage media. You can copy partitions in their entirety for backup, as well as organizing backup copies; the tool can reload data from a disk back onto a partition. All of the functions offered by Paragon Partition Manager are guided, making any storage-related task easy even for non-technical users. Although the basic Paragon Partition Manager is free to use, there are also more comprehensive file storage management features available to businesses in a paid upgrade. The AOMEI Partition Assistant is available in both free and paid version. There are editions for Windows and Windows Server – both 32-bit and 64-bit. The free version is called the AOMEI Partition Assistant Standard Edition and the paid version is called the Professional Edition. It will run on Windows XP, Vista, 7, 8, 8.1, and 10. The free version for Windows Server is called AOMEI Partition Assistant Lite and the paid version is called AOMEI Partition Assistant Server Edition. It is currently operational for Windows Server 2000, 2003, 2008, 2012, and 2016. Both of the free versions of the tool enable you to format partitions, and also create, adjust, and delete them. The paid versions have more advanced features, such as enabling dynamic adjustments to partition sizes. There are two higher-grade options which are the AOMEI Partition Assistant Unlimited, which enables you to install and run the software on an unlimited number of computers in your company. The other is AOMEI Partition Assistant Technician, which allows you to install and operate the software on the computers of clients that you service, so that is a good option for managed service providers. DriveClone includes a bunch of utilities for managing hard drives and protecting the data that they contain. This utility doesn’t create partitions like Ranish Partition Manager, but it does cover many of the backup features of the Ranish product. This utility will enable you to create a bootable disk and help you recover from disasters that prevent your Windows computer from starting up. The storage medium can be either a CD or a USB stick. The cloning facilities of this utility offer lots of options. You can set the system to just perform a straight copy onto CD or USB stick of a partition. You can also restore a partition’s contents from a backup source. Other cloning options let you create incremental backups, so you can continue to add new files to your backup copy as you add them to your hard drive. This saves you having to copy over the entire contents of a partition every time you want to update a backup. You can also copy a drive’s contents across a network. By this method, you centralize storage away from individual end-user devices to a file server. You can then make the stored files available from any terminal on the network via virtualization through VMWare or Hyper-V. The tool keeps comprehensive logs of back up transactions so you can trace or block unauthorized copying of stored files. 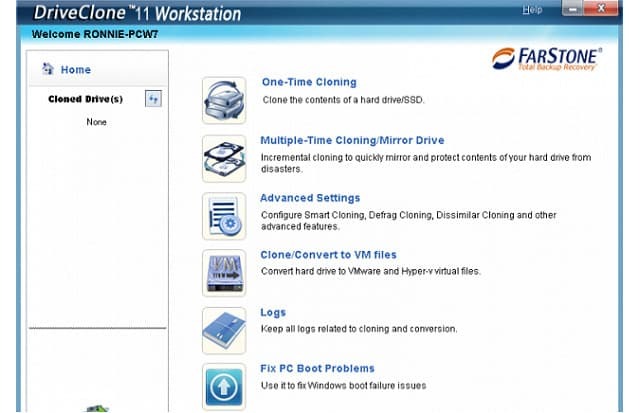 DriveClone runs on Windows 7, 8, and 10. Unfortunately, the system isn’t free. It is offered in three versions. The basic package allows access to one user. The next version up covers five users. The top edition of the system is designed for companies with a large number of users. 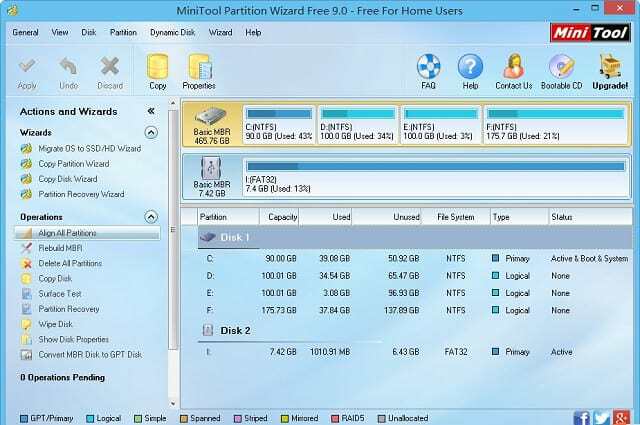 The functionality of Minitools Partition Wizard is a very good match to the utilities of Ranish Partition Manager. You can create, adjust, and remove partitions with this package and it is free for home use. The partition adjustment capabilities of Minitools Partition Wizard include facilities to resize partitions and also convert the file system used. You can nominate a partition to be primary or remove that designation. There are many editions of this tool, with the Free Edition being the entry level. Paid upgrades include the Pro Edition and the Bootable CD version, which enables you to get access to a computer even when it doesn’t have an operating system or when the computer’s boot sector gets damaged and needs to be restored. Two higher-paid versions are aimed specifically at businesses. These are the Server Edition and the Enterprise Edition. The Technical Edition was created to assist managed service providers in supporting their clients. Those higher versions include dynamic disk management which will resize your disk partitions automatically according to the business demand. The Minitools Partition Wizard is only available for Windows. However, it will run on all current versions of that operating system. 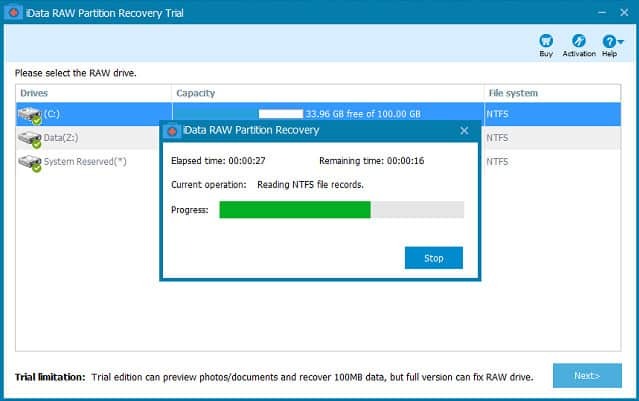 The RAW Partition Recovery package from iData Recovery is a popular tool for all versions of Windows that gets very high ratings from its users. The system runs on all versions of Windows and Windows Server and is even free for corporate use. As the name suggests, this utility focuses on raw data. It is capable of backing up partitions and restoring data to your computer’s file system in the event of data loss. The concept of raw data manipulation boils down to accessing disk contents at the bit level, rather than dealing with file manipulation utilities provided by the operating system. This strategy gets around any errors that might arise from different operating system types or version presenting you with interpretation errors. This utility is able to resolve a range of file system errors that can appear on Windows. These include filenames that have special characters in them, file table corruption, disk sector damage, formatting problems, and unusual file extensions and types. If your file system is finding it difficult to interpret file names and contents, then the Free RAW Partition Recovery tool will sort out those problems. The EaseUS Partition Master is available in both free and paid versions. The free edition is a great tool for home use. The software will run on all versions of the Windows operating system. The paid versions come in a Pro Edition for Windows and a Server Edition that works on Windows Server. The free version has all of the key features that you would get from Ranish Partition Manager. These include the ability to create, adjust and remove partitions and copy partitions to backup. Business users are expected to pay for the software, but they get much more functionality for their money than the home users of the free edition. With the paid version of the system you can: copy over the operating system from one partition to another, set partition sizes to adjust automatically to create dynamic volumes, manage virtual disks, convert between MBR and GPT, convert between FAT and NTFS, and create bootable USB sticks. The software can back up your files systems to USB, HDD, SSD, SD card, memory card, and other external storage media. It will also manage data restoration in the event of accidental damage to your hard drives. This is a great system that manages an array of storage utilities. It can change the partition labels, wipe and merge partitions, and also check the integrity of disks. If you have a new disk, or you want to wipe out all of the occupied space on a disk, you can choose to format those disks and storage devices through the EaseUS interface. It is a little annoying that business users can’t access the utility for free. However, EaseUS does offer the Pro version of the Partition Master on a free trial. There is also a free trial for the Server Edition. Dividing up disks into partitions has a lot of benefits. It allows you to run several different operating systems on the same computer and the technique can also help you allocate storage space to different user groups or application types. However, the rigid dividing of partitions can sometimes create problems. If your allocation policy means that a logging system runs out of storage space overnight, you will be losing valuable system information and exposing your system to danger. So, you also need to investigate dynamic partitions. The many benefits that you can derive from using partitions can turn into bottlenecks and extra workload if you don’t organize your partition strategy. You need a partition manager so that you can get all of the benefits of using partitions without encountering the headaches. Do you use a partition manager? Are you still able to use Ranish Partition Manager, or did you have to stop using it when you upgraded to Windows 10? Have you tried any of the recommended software on our list? Leave a message in the Comments section and share your experience with the community.